The film was scored by composer Armando Trovajoli, who makes a brief appearance as the driver of a red Ferrari who stops to help Anna and Renzo by the side of the road. In his plaid sport jacket, Giorgio Ferrario (Armando Trovajoli) looks like he could be just as willing to sell Anna a car as much as he’s willing to give her a ride in his own. 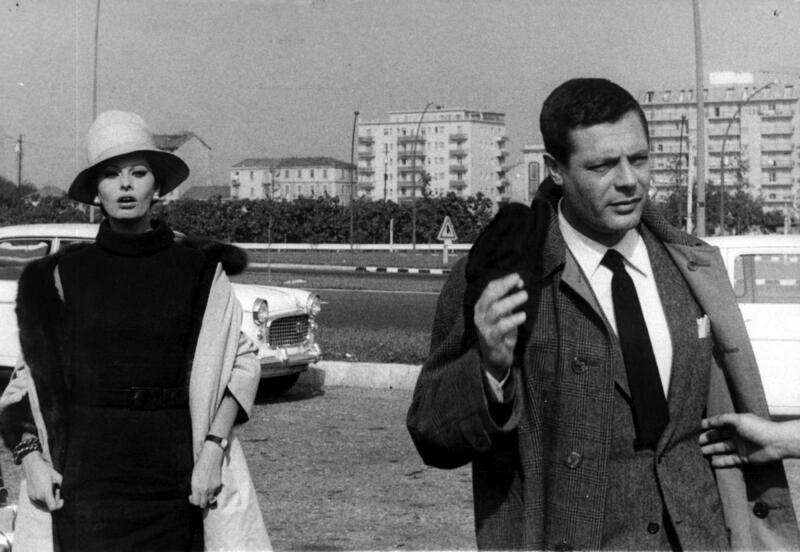 His sense of style adds a new level that clearly interrupts the dynamic of sophisticated Anna and the subdued Renzo. Trovajoli composed three tracks for this sequence with the jazzy “Descansado” providing a bossa nova background for much of Anna and Renzo’s romantic and scenic drive through the Lombardy countryside. Released in the United States in March 1964, the movie received Best Foreign Language Film at the 37th Academy Awards while Mastroianni took home a BAFTA Award for Best Foreign Actor. Yesterday, Today and Tomorrow also has the somewhat less significant distinction of being the last movie that I watched on FilmStruck before the streaming service ended its operations at the end of last month. Renzo is the most traditionally dressed of Marcello Mastroianni’s three characters in Yesterday, Today and Tomorrow, bridging the gap between the working-class Carmine in his untucked henleys and polo shirts and ratty striped trousers, and the opulent bon vivant Augusto Rusconi with his bespoke summer suit, blazer, and boldly banded hat. Renzo makes his first appearance in “Anna” when he emerges from his car – a Fiat 600, of course – and walks up to the passenger side of her Rolls. He is draped in a fawn-toned glen plaid wool raglan coat, a practical and understatedly stylish for a drive with his lover on a late October afternoon in Milan. Renzo’s coat collar has a buttonhole through each leaf. The coat has five buttons from the neck down to below the waist, with an additional button under the right collar leaf. Each of the five buttons down the right side of the front is sewn adjacent to a buttonhole that corresponds to a button on the inside of the coat’s tan wool lining. 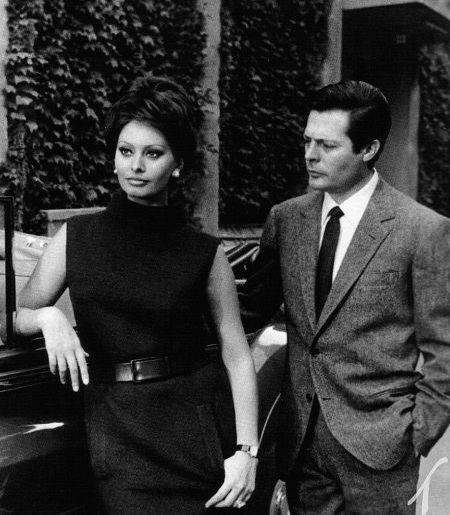 Sophia Loren and Marcello Mastroianni on set in Milan. Note the buttons down the inside of the lining on the left side… and the outside buttons sewn next to additional buttonholes on right side. Renzo’s coat has raglan sleeves that end with a short, single-button half-tab on each cuff. Compared to the materialistic Anna in her Christian Dior ensemble of mink coat and jet black dress, Renzo comes across as earthy, grounded, and genuine in his simple but well-cut brown tweed suit, a warm and practical choice for the fall afternoon. Renzo is on the fence – or guardrail, in this case – when it comes to Anna. The single-breasted suit jacket has notch lapels that roll to a two-button front. Renzo initially wears the welted breast pocket unadorned, though he stuffs in the used white handkerchief after fussing with the crashed car. The jacket also has straight jetted hip pockets, a ventless back, and three-button cuffs that appear to be functioning “surgeon’s cuffs”, though – unlike his more rakish character in “Mara” – Marcello wears them fastened. Their assignation interrupted, Renzo and Anna get back into the car. Renzo’s matching suit trousers have single pleats in the outward-facing or “reverse” style often associated with Italian tailoring. Worn beltless, they have straight pockets along the side seams and jetted back pockets. The bottoms are finished with turn-ups (cuffs) with a full break. After incurring Anna’s wrath for almost smothering a fire with her mink coat, Renzo offers up his own suit jacket and shows off his pleated trousers in the process. Renzo’s white cotton shirt is subtly patterned with a gray mini-grid check. Note the details of Renzo’s glen plaid coat, mini-checked white shirt, and brown tweed trousers. 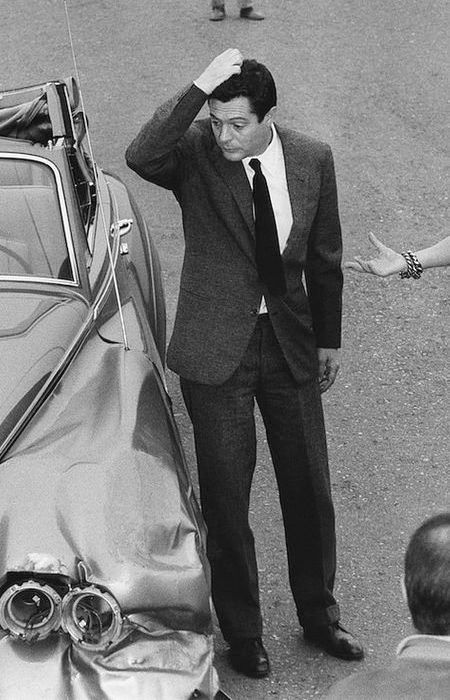 Note also Anna’s roving hand, which considerably shortens the life of her dear Rolls-Royce. The shirt is detailed with a point collar and single-button cuffs with a steep cutaway curve. 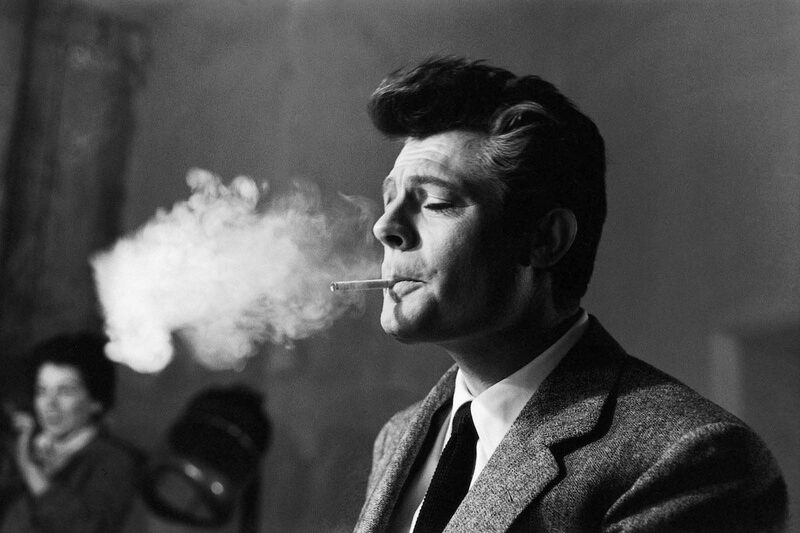 Renzo wears a solid black woven silk tie, echoing the simple yet elegant aesthetic of his iconic suits in La Dolce Vita (1960) three years earlier. Exhausted from attempted car repairs and failed relationship repairs, Renzo sits by the side of the road with his shirt and tie loosened at the neck. Renzo wears black calf cap-toe derby shoes with V-shaped lacing that tapers inward. His dark socks appear to be brown, possibly a thin silk. Renzo’s limited automotive repair knowledge doesn’t do the Rolls – or his budding relationship with Anna – much good. Though he would be a Rolex wearer later in life, Mastroianni’s watch in the “Anna” sequence of Yesterday, Today and Tomorrow is too briefly glimpsed for a definitive ID on the maker. It has a gold case that emerges from his shirt cuff at times, flashing a round white dial and a dark leather strap. In good times… and in bad. Poor Renzo is forced to put his suit jacket into service to hope to salvage Anna’s wrecked Rolls. By the early 1960s, the Rolls-Royce had enjoyed six decades of an association with opulent elegance and innovative production – interrupted only by World War II – that led to stars like John Lennon, Elvis Presley, and Frank Sinatra acquiring them as status symbols. Anna’s Rolls-Royce Silver Cloud III is the ultimate status symbol in Yesterday, Today and Tomorrow. Rolls-Royce began production of the first generation Silver Cloud in April 1955, a time that the marque was beginning to equip all of its cars with automatic rather than manual transmissions as standard equipment. More than 2,200 cars had been produced by 1959, when the Silver Cloud II was introduced with a V8 engine that was arguably more powerful but far less smooth than the previous iteration’s straight-six cylinder engine. The Silver Cloud III made its world debut in October 1962, and production soon began on a run of 2,044 cars that would be introduced for the 1963 model year. In addition to slight cosmetic changes from the previous model, the V8 engine was also increased with 2-inch carburetors, an increased compression ratio of 9:1, and a nitrate-hardened crankshaft to accommodate the increased in power, which Rolls-Royce left characteristically undisclosed but has been estimated at around 200 horsepower. You can read more about Silver Cloud III performance and specs here. Hyde Park bespoke coachbuilder Mulliner Park Ward, formed by Rolls-Royce Limited in 1961 after the merger of H.J. Mulliner & Co. and Park Ward, continued to style coaches with the Silver Cloud III, and the Drop Head Coupe featured in Yesterday, Today and Tomorrow is of a Mulliner Park Ward design. A total of 7,372 Rolls-Royce Silver Clouds would be produced across all three series of the car’s production from 1955 to 1966, when it was replaced by the Silver Shadow, Rolls-Royce’s first car to use unitary body and chassis production. 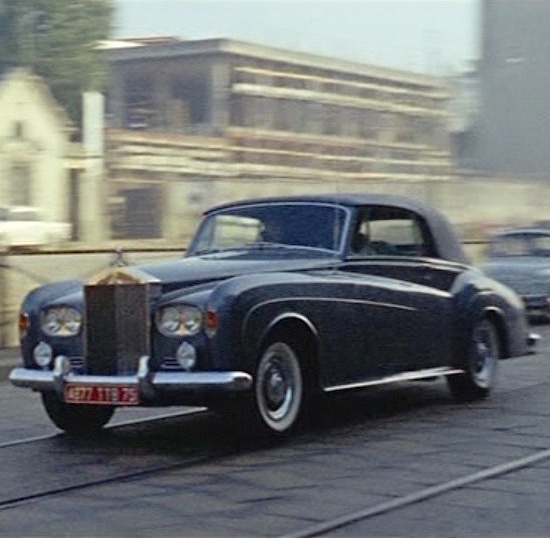 After Renzo “mishandles” Anna’s Rolls-Royce, she fetches a ride from the plaid-jacketed Giorgio Ferrario, who is speeding though the countryside in a red 1960 Ferrari 250 GT California Spyder SWB, a rare sports car with less than 60 examples made, including ones owned by actors James Coburn and Alain Delon. It was a fiberglass replica of a ’61 California Spyder SWB that was famously featured in Ferris Bueller’s Day Off (1986). Cameron’s dad had a right to be upset, as auctioned cars have picked up more than $10 million at auctions over the last few years. With his Ivy-inspired plaid raglan coat and tweed suit, Marcello Mastroianni’s simple and timeless outfit as Renzo would look just as appropriate in Massachusetts or Merseyside as it does in Milan. Versions of varying quality have been released for home video and streaming since the film fell into public domain, but consensus among reviewers seems to agree that the best version has been released by Kino Lorber Films, both on its own as well as in the Sophia Loren “Award Collection” box set that also includes Marriage Italian Style and Sunflower, two more of her 13 collaborations with co-star Marcello Mastroianni. Great post. Thanks for sharing. Never saw this film and will definitely check it out, although it should of been assumed that Mastroianni and Loren worked together at some point. The color photos show off the pattern of the overcoat better. I love the Tweed suit. I would have preferred a knit tie – black or brown. I’d also go with a champagne colored handkerchief to blend between the dress shirt and the suit. That album cover for the soundtrack belongs on a wall.